This article describes the first day on Phi Phi Island in peak season from December 2010 to January 2011 on a day of perfect high, peak season weather. The island was fun, busy and this article provides a few clues as what to do to get away from some of the busier spots. 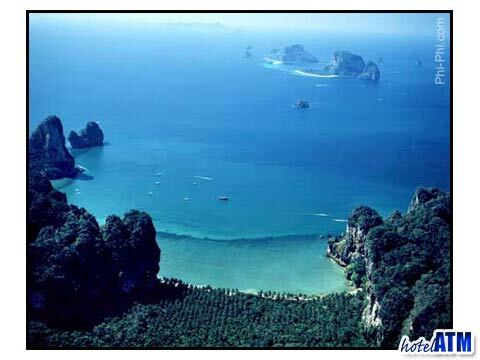 You can't quite put it words when you visit Phi Phi island in high season. For many say Phi Phi has too many one day trippers from Phuket and there are too many boats. For me and for the thousands of people who visit Phi Phi Don regularly and have done for years, the islands have a rare and impressive magic that roars up on your senses as you approach the commanding cliffs and spills over into joy as you round the southern headland of Phi Phi Don and see the famous Tonsai Bay, the hotels and the main village. The first change to be noticed is that the local government implemented the 20 THB (40 Cent Euro, 60 cents USD, 50p GBP ) fee for each staying visitor to the island. This isnt itself an imposition by monetary value but they need to advertise this at the ferry pier in Phuket, Krabi, Lanta so everybody can get their change ready! The government officers collect the money as you get of the boat and head down the pier. We went in December this year and stayed at the PP Palmtree Resort on Phi Phi Don with friends who were new to the island and family who have been there over a dozen times. We had 5 rooms and so the owners of Khun Mint and Khun Palm (brother and sister) were very glad to see us. I took the pool access rooms on the ground floor as I wanted to spoil the family over the Christmas period but we booked the rooms late for our friends from the UK and the Philippines so they had rooms on the second floor. My job as usual when I take friends to Phi Phi to show them the best of the best so we met up back at the Siam UK Tours office near the pier and signed up for a private hire of a speedboat to take a look around. We headed straight up to the Zeavola Resort, the only 5 star resort on Phi Phi island for a superb lunch and a well earned rest after our travels, (we had an early 7am start to get the 8.30 boat from Rasada PierPhuket). While a few of the more relaxed friends snoozed under the palm trees at the resort I took the kids out to Hin Klang for some of Phi Phi Island's best shallow reef snorkeling. The tsunami off 2005 made little impact on the reef however their had been some negative effect from the unusually high temperatures in the sea with some Stag head coral loss. Even so the party agreed this was the best coral and marine life they had seen in the region (they lived in Phuket for 10 years and had seen a few decent reefs) and so with this thumbs up we went back to pick up the rest of the sleepy heads on the beach. In the afternoon we went to Nui Bay and swam around camel rock, saw the giant blow holes that spurt out sea water when the caves behind the cliffs got compressed, swam into a cave and generally had an easy time. The air temperature had started to cool off and so the sun wasn't quite so strong. On our return to Phi Phi Don we stopped in on Wang Long. In the evening we had a great fresh Phi Phi seafood meal from the bar BQ down on the beach at the Tonsai Restaurant next to the Phi Phi Banyan Villa. Here we had a beach front view of the bay and the twinkling lights of the boats and the starry night made for a perfect backdrop for a good meal.